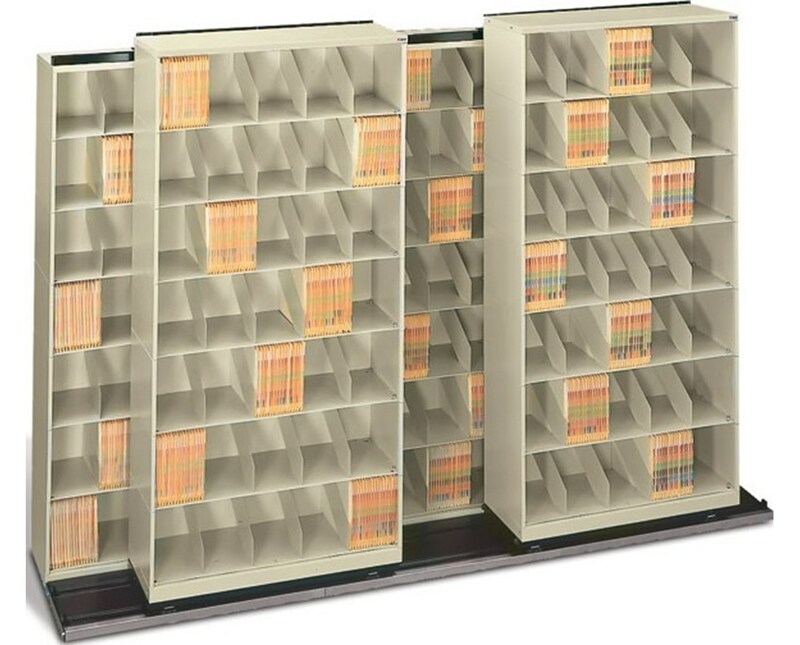 Unit Width: 36", 42", 48"
The versatile ThinStak BiSlider Open Shelf Filing System helps keep your medical documents organized and accessible while taking up a minimal amount of floor space. This configuration includes a double row of shelves with three shelving units in the back and two in the front. You can view many other customizable unit configurations in the Related Products Tab above. When compared to lateral filing cabinets, this model stores more than 50% additional files while taking up 27% less floor space. It consists of individual stackable shelf tiers with fixed or movable dividers on each tier, creating a complete shelving unit. Its configurable design allows you to add additional tiers and units for more storage space. It is incredibly durable and sturdy, manufactured from rust-free cold rolled steel without any sharp edges. The tiers are welded together using the latest manufacturing technologies for a true state-of-the-art, dependable shelving unit. The Bi-Slider double depth file storage system consists of two rows of shelving units in which the front row slides from side to side on tracks, providing access to the back row of files. This method of storing your medical files greatly maximizes the use of floor space. The modular design of this system allows for easy expansion as your storage requirements increase. All Datum TrakSlider™ systems can be reconfigured and added onto at any time without the need to disassemble, relocate, or remove existing files. All Datum TrakSlider™ track units consist of modular, all-welded steel frame and rail assemblies, flush decking, lateral rolling carriages, as well as overhead stabilizer and roller assemblies. The carriages include four wheels that ride on a double rail track for an added measure of stability and safety. The heavy-duty welded steel construction of this system includes an overhead anti-tip mechanism to ensure safe and easy movement of files. A reinforced steel leveling track means you can use the system safely, even on non-level floors! The ThinStak Bi-Slider Filing System comes with several customizable options in order to provide you with the perfect product that fits your specific needs. Select your preferences from the options shown above. There are three depth options to fit different types of medical files - Letter, Legal, or X-Ray. You can choose from the following overall widths for your shelving units. Choose the amount of tiers you would like your unit to have. Compact shelvingprofile increased storage space and efficiency. Overall Depth Letter: 28-3/8", Legal: 34-3/8", X-Ray: 40-3/8"
Product Weight 899 - 1,457 lbs. 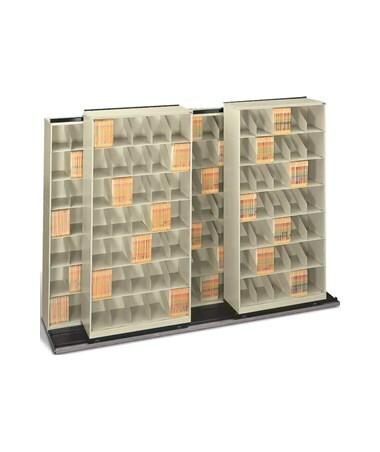 Individual Shelving Unit Height 10", 11", 15"
Filing Capacity (LFI) 875" - 1,880"